The noble House of Sela is shattered. Its five children, once heirs to a bustling port, are scattered around the Encircled Sea. 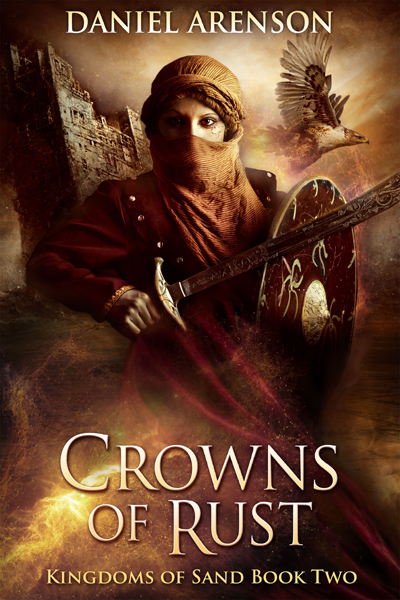 Their kingdom, the ancient land of Zohar, lies in ruin following a devastating invasion. As the dust settles, new fires kindle. In a shattering world, the pieces are up for grabs. Here fleets clash at sea, and desert warriors battle among dunes and ancient ruins; cloaked conspirators gather in shadowy alleyways, vowing to slay their emperor; and a girl seeks the magic of light beyond guardians of shadow. In a land of sand and splendor, glory will go to those with the sharpest steel and the hardest hearts. One war has ended. Now the world will burn. When the Encircled Sea storms, kingdoms are no sturdier than sandcastles. Rulers and rebels battle for golden thrones, but will they find only crowns of rust?